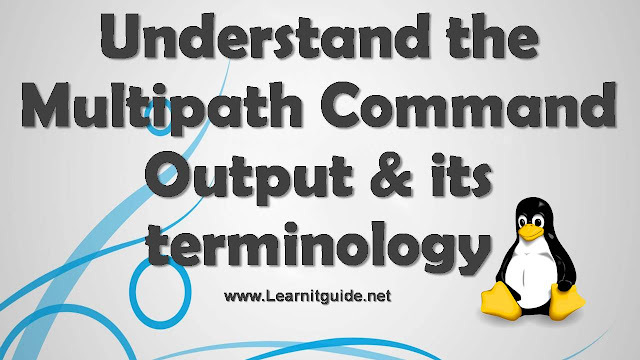 This article explains to Understand the Multipath Command Output & its terminology. In the previous article, we have explained how to Configure Multipathing in Linux (RHEL7/CentOS7). Lets understand multipath command output to check further for troubleshooting any issue related with multipathing and also understand its terminologies. Understand the Standard output of multipath command. Connection from the server through a HBA to a specific LUN. Without DM-MP, each path would appear as a separate device. Paths are grouped into a path groups. At any point of time only path group will be active. Path selector decides which path in the path group gets to send the next I/O. I/O will be sent only to the active path. Each path has a specific priority. A priority callout program provides the priority for a given path. The user space commands use this priority value to choose an active path. In the group_by_prio path grouping policy, path priority is used to group the paths together and change their relative weight with the round robin path selector. Sum of priorities of all non-faulty paths in a path group. By default, the multipathd daemon tries to keep the path group with the highest priority active. multibus: One path group is formed with all paths to a LUN. Suitable for devices that are in Active/Active mode. failover: Each path group will have only one path. group_by_serial: One path group per storage controller(serial). All paths that connect to the LUN through a controller are assigned to a path group. Suitable for devices that are in Active/Passive mode. group_by_prio: Paths with same priority will be assigned to a path group. group_by_node_name: Paths with same target node name will be assigned to a path group. Setting multibus as path grouping policy for a storage device in Active/Passive mode will reduce the I/O performance. A kernel multipath component that determines which path will be chosen for the next I/O. Path selector can have an appropriate load balancing algorithm. Currently one one path selector exists, which is the round-robin. readsector0: sends a read command to sector 0 at regular time interval. Produce lot of error messages in Active/Passive mode. Hence, suitable only for Active/Active mode. tur: sends a test unit ready command at regular interval. rdac: specific to the lsi-rdac device. Sends a inquiry command and sets the status of the path appropriately. ready: Path is up and can handle I/O requests. faulty: Path is down and cannot handle I/O requests. ghost: Path is a passive path. This state is shown in the passive path in Active/Passive mode. shaky: Path is up, but temporarily not available for I/O requests. active: Last I/O sent to this path successfully completed. Analogous to ready path state. failed: Last I/O to this path failed. Analogous to faulty path state. active: I/O will be sent to the multipath device will be sent to this path group. Only one path group will be in this state. enabled: If none of the paths in the active path group is in the ready state, I/O will be sent these path groups. There can be one or more path groups in this state. disabled: In none of the paths in the active path group and enabled path group is in the ready state. I/O will be sent to these path groups. There can be one or more path groups in this state. This state is available only for certain storage devices. A standalone program that returns a globally unique identifier for a path. multipath/multipathd invokes this callout and uses the ID returned to coalesce multiple paths to a single multipath device. A standalone program that returns the priority for a path. multipath/multipathd invokes this callout and uses the priority value of the paths to determine the active path group. Kernel personality module for storage devices that needs special handling. This module is responsible for enabling a path (at the device level) during initialization, failover and failback. It is also responsible for handling device specific sense error codes. When all the paths in a path group are in faulty state, one of the enabled path group (path with highest priority) with any paths in ready state will be made active. If there is no paths in ready state in any of the enabled path groups, then one of the disabled path group (path with highest priority) will be made active. Making a new path group active is also referred as switching of path group. Original active path group's state will be changed to enabled. A failed path can become active at any point of time. multipathd keeps checking the path. Once it finds a path is active, it will change the state of the path to ready. If this action makes one of the enabled path group's priority to be higher than the current active path group, multipathd may choose to failback to the highest priority path group. immediate: Immediately failback to the highest priority path group. # of seconds: Wait for the specified number of seconds, for I/O to stabilize, then failback to the highest priority path group. do nothing: Do nothing, user explicitly fails back to the highest priority path group. This policy selection can be set by the user through /etc/multipath.conf. Storage devices with 2 controller can be configured in this mode. Active/Active means that both the controllers can process I/Os. Storage devices with 2 controller can be configured in this mode. Active/Passive means that one of the controllers(active) can process I/Os, and the other one(passive) is in a standby mode. I/Os to the passive controller will fail. A user friendly and/or user defined name for a DM device. By default, WWID is used for the DM device. This is the name that is listed in /dev/disk/by-name directory. When the user_friendly_names configuration option is set, the alias of a DM device will have the form of mpath<n>. User also has the option of setting a unique alias for each multipath device. Support Us: Share with your friends and groups. Stay connected with us on social networking sites, Thank you.